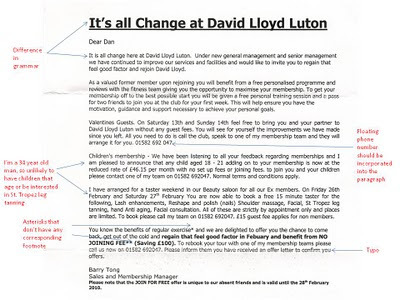 I received a direct mail piece last week from the David Lloyd chain of gyms attempting to regain me as a member. It’s been over 3 years since I left so they must be contacting pretty much everyone who used to have a membership. With membership around £70 a month they can afford a scattergun approach as their mailing (with 25p mailing cost) doesn’t need a huge response rate for the campaign to pay its way. Selling gym memberships is a rare example in business where almost all incremental sales revenue is incremental profit so with the sums involved you’d expect a professional approach. Far too often companies treat ex-customers as a homogenous group without considering why the person left, how likely they are to come back and what incentive would be required to get them back. Rather than concerning themselves with maximising the value of this pool of ex-customers, as long as a campaign is profitable no further questions are asked. AnalysisMarketing help businesses to get more value from their database. We like to get into the detail of your data, understand your business needs and come up with strategies and analysis that help to 'move the meter'. Whether you need a database built from scratch, custom reporting or analytics training we can provide an affordable solution.